We are fortunate to live in a day and age when advances in technology provide you with a variety of choices when it comes to fixing your sewer line. In the not too distant past, plumbing contractors could only offer their customers one option. 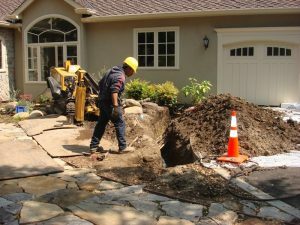 It is called the traditional excavation method, which is aptly named since plenty of plumbing contractors has been employing it for decades. This method utilizes heavy-duty hydraulic construction equipment in order to excavate trenches that run as long and as deep as the sewer pipes are buried. Keep in mind that an average sewer pipeline can be hundreds of feet in length from the building’s foundation to either the city’s main sewer line buried under the street or a private septic tank buried on the property. That means that the trench also runs for hundreds of feet. Since the sewer pipeline is buried underground any of the landscaping and hardscaping located above it is completely destroyed in the process. The plumbing contractor is not responsible for replacing any of the items that are ruined. They are only required to fill the trench back in with dirt. Once they move on to their next job, the property owner must either hire additional contractors to restore the landscaping and hardscaping or pay for the materials and do the work themselves. The traditional excavation method is a long process, to say the least. By the time the trench is initially dug, the sewer pipeline is repaired, and the trench is filled back in with dirt it can end up taking multiple weeks. Then you need to add on additional time to get the landscaping and hardscaping back in its proper state. The good news is that trenchless sewer repair procedures were invented to solve this costly and expensive problem. This high-tech approach does not require the excavation of a trench, only a small access point at one end of the sewer pipeline. A machine uses the access point to install a tube into the sewer pipes. The tube is covered with a felt lining that has been saturated in a wet epoxy resin. When the tube is inflated the wet epoxy resin coats the interior surface areas of the sewer pipes. The tube is then removed, which allows for the epoxy to harden or cure in place. After a few hours, it forms a pipe liner that in essence is a brand new pipe within the old one. The new liner seals off any breaks, cracks, chips, holes, or rotten spots and prevents future damage from causing any problems with the sewer system. It only takes a day to complete the entire Nu Drain trenchless pipe lining process from start to finish. Once the job is complete the small access point is simply filled in as if it never existed. The liner will last for well over fifty years. When all is said and done Nu Drain is over fifty-percent more cost-effective than the traditional excavation method, making it a win-win situation for the residential, commercial, and industrial real estate owner as well as the plumbing contractor. Please contact us today to schedule a sewer repair estimate with Nu Flow Technologies.